How is Kenney College able to provide 100% tuition scholarships to the self-employed in 2015? The historical mission of higher education is to teach, research, and serve. Colleges have traditionally generated revenue through tuition, which subsidizes faculty research. We hold true to the mission of academia. However, we believe it is more economical—and better for faculty, students and society—when research subsidizes tuition. We generate revenue by performing corporate entrepreneurship related research and development for established companies. In turn, we use a portion of our income to subsidize student tuition. We keep enrollment limited so that we can keep costs low, and provide maximum value. Who is qualified for the scholarship? Any student accepted into the MBA program in 2015. Our admissions qualifications are detailed in our course catalog, which can be downloaded via www.kenneymba.com. Economic data suggests an MBA is an excellent investment towards increasing one’s lifetime earnings and employability. However, it is also a sizable investment. By helping our students with their tuition, we are helping their families, and their businesses. Every dollar we invest in our students has an economic value-added benefit for their communities. The exact economic return for communities is something we are measuring longitudinally. What is the envelopment of Kenney College with large companies? Our work with employers is based on a simple premise: As people grow, companies grow. It is important to understand that—evolutionary speaking—management is a branch of economics; and marketing is a branch of management. Many executives link marketing and economics easily enough, but skip over the importance of employee satisfaction. Numerous studies show a strong positive correlation between employee satisfaction and customer satisfaction. Of course, customer satisfaction tends to manifest as brand loyalty and enhanced profitability. Our role is that of an educational partner. We help employees grow personally and professionally. By extension, our client grows too. How does Kenney College help to re-connect the culture of corporations with their entrepreneurial heritage? Every large company was once a small start-up. As companies grow, systems develop to facilitate this growth. These systems are important, but also tend to give rise to bureaucracy and contentment that stifles innovation in the long-term. Re-connecting with an entrepreneurial heritage is done through our proprietary corporate entrepreneurship model. It takes an organizational commitment, but the results are extraordinary. What are the benefits of working with Kenney College? Please list specific ones. What we see are significant increases in employee productivity, with simultaneously enhanced employee satisfaction, and customer satisfaction. Clients also see other fruits of corporate entrepreneurship, which include the creation of new brands, innovative cost savings, and employee advancement. How is corporate entrepreneurship linked to competitive advantage? Many factors combine to create competitive advantage. However, studies show that companies with entrepreneurial cultures financially out-perform their competitors regardless of industry. Studies also show that entrepreneurial firms attract better-qualified applicants, and are more market-oriented. The scholarly evidence is overwhelming: If you want your company to grow and prosper, maintain an entrepreneurial culture. If your company has lost it, it is possible to get it back. What are the advantages of being self-employed versus working for a corporation? There are certainly differences we can examine objectively. Self-employment is enticing because it satisfies the inherent need for control many entrepreneurs possess. Getting paid twice—by earning a salary and building equity—is also nice. While about fifteen percent of the workforce is self-employed, this segment represents about 30% of all millionaires in the United States. However, there are also studies that show self-employed individuals—on average—earn less than equally qualified professionals in the corporate world. Entrepreneurship is a manifestation of human talent and creativity. However, it is not synonymous with self-employment. Sometimes there are more opportunities for entrepreneurs within existing corporations. Those who embody the traits of an entrepreneur within an existing system are known as corporate entrepreneurs, or intrapreneurs. I grew-up working in a family business started by my grandfather during the Great Depression. My first memories are of working with my grandparents and father in our family business. I launched my first solo-venture in my early twenties, outsourcing the production of family recipes to manufacturers, and selling the finished products to supermarkets. 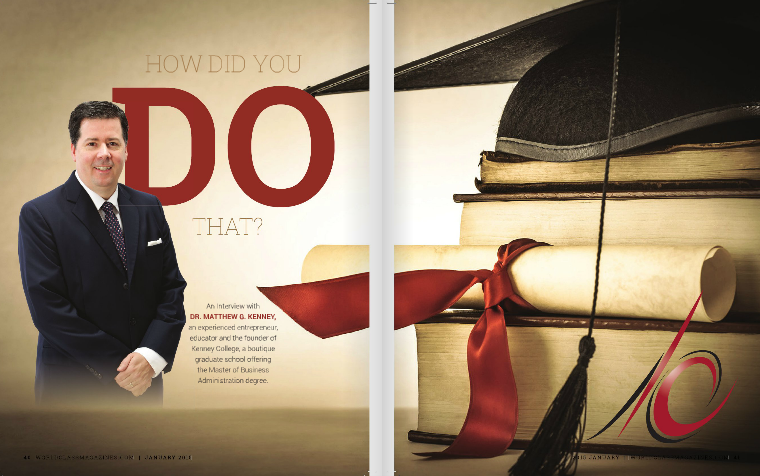 The first question other entrepreneurs would ask me was, ‘how did you do that?’ I enjoyed teaching other entrepreneurs, which led me eventually to academia. I served as Entrepreneur-in-Residence for my alma mater after earning my MBA. This led to becoming a business professor, earning a doctorate in business administration with a marketing concentration, and ultimately starting Kenney College in 2009. What are some important aspects you teach at Kenney College on successful entrepreneurship? I think pretty much all MBA programs do a great job of teaching the science of business. What we try to integrate is the type of qualitative knowledge that one cannot get from a textbook. For example, how you must be good at being small before trying to be good at being big. How your reputation for being ethical enhances your brand. How money arrives when there is congruence between what you do professionally, and what you feel called to do spiritually. Your thoughts on conventional college education? Overall, a conventional college education will serve you well. The economic data is clear: Education is a good investment. Ben Franklin said education is the investment that pays the best dividend. I believe his words hold true today. While a college education is tremendously valuable, the higher education system that delivers it is going through a paradigm shift. It is a complex industry, with complex challenges. How is Kenney College different form other business schools? Studies show that the majority of the self-employed are kinesthetic learners. Essentially, we learn best by doing. This is why we created a model where the student’s business becomes a practicum. We are the only business school that takes this approach. We are also different in that we have low student faculty ratios, never more than 10-1. Of course, we are unique in striving to provide free graduate education when possible. What kind of entrepreneurship research do you perform at Kenney College? Although we are a young college, our team is performing some of the most exciting research within the business-school arena. For example, we are measuring the effect of corporate entrepreneurship education on large firm performance. While business educators and practitioners are increasingly aware of the value of corporate entrepreneurship, less is known about how to use education as a tool for changing attitudes and behaviors. Our clients are truly ahead of the curve because they are getting answers to questions that their competitors are not even asking.